Uses or benefits of alum are not just confined to people. Alum’s antiseptic properties combat razor burns and soothe them. Even though alum reminds many people about shaving, this crystal block has abundant benefits for your hair, skin and overall health. There are different types of alum, which are based on the chemical compounds. However, the one commonly used in households contains potassium, sulfate and aluminum. You can probably get alum in blocks at your local store. Extensive use of alum includes treating canker sores, purifying water, healing cracked heels and reducing mouth odor. In this article we will check out all the uses of alum that are good for your health. When it comes to canker sores, a small piece of alum needs to be powdered and then a pinch of that alum powder has to be pressed over the canker sore. It may sting for a while, but after 24 hours, usually the persion is relieved of canker sores. However, many people and young children don’t like to use the alum powder because they find it hard to bear the burn which is caused due to alum powder. A good way to use alum to get rid of mouth sores is this homemade alum mouth rinse. In order to make it, all you have to do is powder alum in a mortar and pestle, boil water in a pan with a bit of salt, and, once the salt has dissolved, remove from the heat and stir in the alum powder. When the alum is dissloved, strain and use it as a mouth rinse two to three times each day. This mouth rinse can be safely used by both old and young. Make sure not to swallow the raw alum powder while applying over the canker sore and use just a little bit. Alum is great for eye abscess. In order to treat abscess, rub alum on a sandalwood stone along with a small amount of water. You need to rub it well to get a paste, because it does not rub easily into a paste. This paste is very effective, and when applied, it stings initially. The boil breaks on the same day when the paste is applied, giving a person a good relief from eye abscess. For many centuries, alum has been used as an after shave treatment. You’ll get rid of all the expensive after shaves, once you start using alum. You might not like it for the first time, but you will find positive imporvement in your skin tone if you continue to use it. 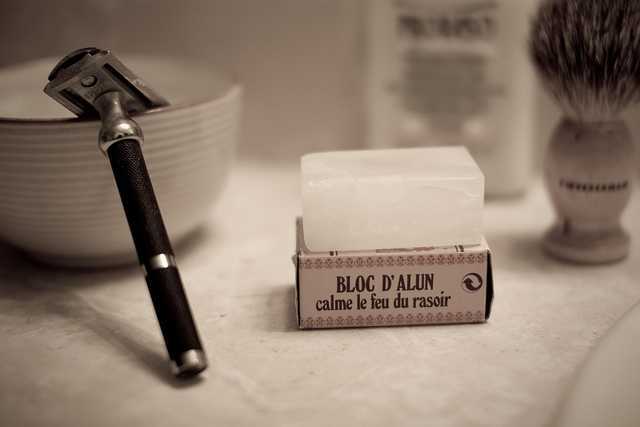 In order to use it after shaving, just rub a piece of alum block over the wet face for a few seconds. You can either leave it on the skin or wash it off. Alum powder is an excellent choice in treating cracked heels. In order to make this remedy, alum needs to be heated in a small empty kadai. Alum liquifies and foams when we heat it. We are left with a crumbly mixture, once all the water evaporates. When it cools down, it is powdered and mixed with coconut oil before applying on the legs. Make sure that the mixture is ground smoothly. Othewise, it’ll be hard to apply it on the heels. If applied regulalrly for some time, this remedy will give amazingly good relief. Alum is efective body hair removal for women. A mixture of water and alum powder can be applied all over the body. Over time, this paste tends to retard the growth of body hair. Alum can be used for water purification. All you have to do is powder alum and then add about one gram of alum powder for every liter of muddy water. After short period of time, you will find the muddy particles settling down, resulting in clear water. Take a small block of alum with you, next time you go on a camping trip. Alum can also be used for winkles. Wet a piece of alum in water and rub it on your damp face for a few seconds. That’s it! Alum tends to tighten your skin. Once you’re done, wash your face in water and then apply moisturizer.